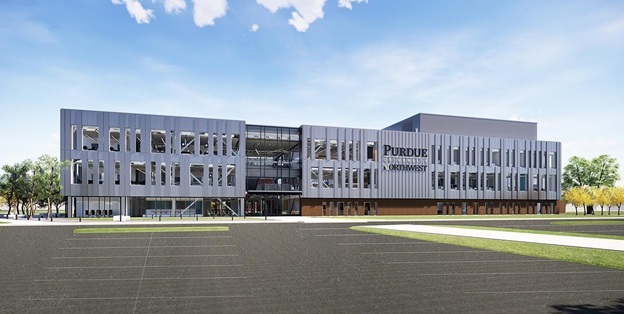 On August 23, the Purdue University Northwest held a ground breaking ceremony for its $40-million Bioscience Innovation Building on the Hammond campus. The 68,000-sq.-ft. facility will house the university’s College of Nursing and the Biological Sciences department, which is within the College of Engineering and Sciences. Designed by CannonDesign, the new building will provide advanced instructional labs, collaborative learning rooms, clinical simulation suites, and research labs. It will accommodate teaching and research programs for the Department of Biological Sciences and the College of Nursing. Berglund Construction/Powers & Sons Construction is serving as the construction manager as contractor for the project. Construction is expected to be completed by spring 2020.